After a while the foam pads may become permanently compressed. In that case they won't provide as much cushion as a fresh set. Changing them out is easy. Remove the old foam pad from the metal plate. Remove enough of the foam so that only the tape and a thin layer of foam remains. Don't use solvents or tools to remove the old mounting tape. Instead, hold the metal plate between your forefinger and thumb, with your thumb at the edge of the old tape/foam residue. Press down with your thumb and push and rub the tape layer away from your hand. The tape will 'roll up' across the surface. When all the tape and foam are removed, wipe the metal surface with rubbing alcohol or a similar solvent to remove any remaining tape residue. Remove the printed liner from one side of the double-sided mounting tape and place it on the metal plate so that the margins around the tape are even. Remove the remaining liner from the mounting tape. Carefully align the foam pad over the metal plate, keeping the margins around the metal plate even, then press the foam pad onto the metal plate. Two 3" x 7.5" x 3/4" thick closed cell foam pads. 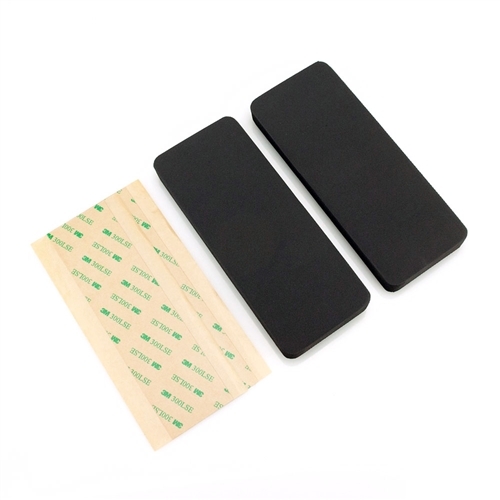 Two pieces double sided high-tech mounting tape (grips foam and powder-coated surfaces).